Laggards, in marketing lingo, are consumers that ride the tail end of the Diffusion Curve. Whether it’s computers, TV sets or toasters, I am not an early adopter. I lag. Every Christmas season (which starts after Halloween), I wrestle with more consumer purchase decision making than the rest of the year. The bustling crowds, blaring holiday music, and banners promoting BOGO’s, only adds to my befuddlement. In comparison, my wife and daughters shop with the endurance of Olympic athletes. An end-of-year-sale was the hook. The four of us stood in the aisle of a big-box store, staring at eighteen TV screens. Customers muttered as they trudged by. The sales agent, a guy named Steve, pitched the merits of pixels, performance, and playback. My brain processed Steve’s pitch when he thwarted my consideration set with terms like HDTV, UHD-TV, and lithium ions. We narrowed the choices to a Panasonic, Sony, or Samsung. The Sony looked better. No, wait, the Samsung. I glanced at the Panasonic. My wife pulled me aside to let an old woman limp by. A herd of consumers ambled behind the old woman and meandered across the big-box’s floor, about the size of a football field. He switched channels on the Panasonic. My mind wandered—retail managers seemingly only hire guys named Steve as order takers. “How much is the Panasonic?” I asked. We bought the Panasonic. With Steve’s help, we loaded it onto a shopping cart larger than a Volkswagen and drove home. My wife and I carried it to our spare bedroom where it remained inside its original box for two months. Later that spring we were ready for our DIY project. 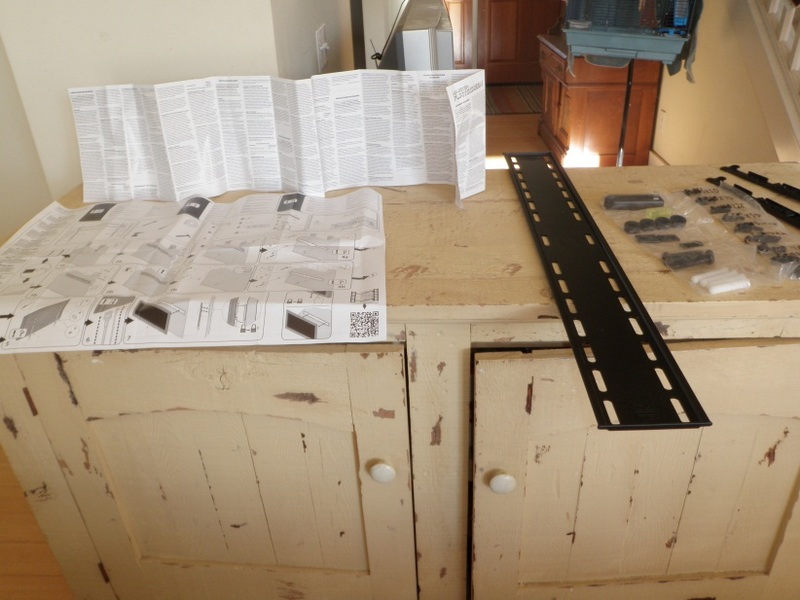 We removed our half-ton, splotchy-screen Zenith and laid out the tools: Screw driver, fasteners, socket wrench, level. 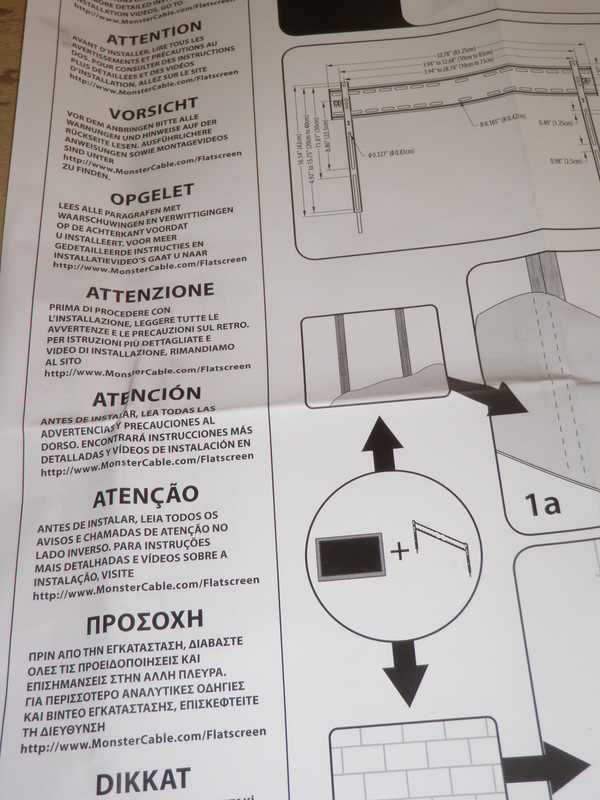 My wife unfolded the mounting bracket instructions, written in Japanese, Portuguese, German, French, Spanish, Russian, Arabic, English and Swahili. National Geographic maps unfolded smaller. My high school daughter trimmed a sheet of paper the dimensions of the TV and taped it to the wall. My 8th grade daughter approved its position. Then, per the instructions, we were ready to drill pilot holes. I searched the house for the drill. No luck. I knew we had a cordless drill somewhere, maybe even two. “I’ll search the garage,” I told my wife, figuring it was misplaced somewhere in that black hole. Guys find weird stuff in their garage while looking for something else. I tripped on a bike pump and unearthed a windshield squeegee. Thirty minutes later I discovered a bird’s nest. Ah, there it is…the drill. But the battery was dead. My wife came out to inspect my progress. Two minutes later she found my twenty-year-old Skil Drill with a cord. Cords help to locate lost tools during search-and-rescue missions. We unpacked the Panasonic. It came with more hardware than we needed, cords attached to nothing, a remote control without batteries, speaker wires, a wireless antennae, and more instructions; but no receiver cord. 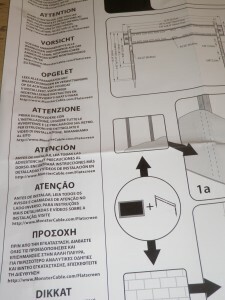 I searched the instructions–in English–for an 800 number. But I couldn’t find our cordless phone. Now I was getting mad. I took a break and read the newspaper while my wife explored the TV’s box. “I found the receiver cord!” she exclaimed, sounding like a gold miner. We leveled and fastened the mounting bracket and inspected our work. My 8th grader asked when we’d be ready. My wife and I lifted it onto the mounting bracket. We removed the TV, reviewed the instructions, and attached the cords, cables and other miscellaneous wires. We adjusted the mounting bracket and re-hoisted the TV. The beast weighed 80 pounds and by now we moved it three times, once from the spare room and twice to hang it. “It doesn’t look level,” said the 8th grader. Three hours, 40 minutes and 20 seconds later, the TV hung. “Dad, what are you going to do with these five extra cords?” asked the 8th grader. Maybe I should’ve spent the hundred bucks. Be sure to visit the Etc.Guy Facebook page and feel free to LIKE IT. 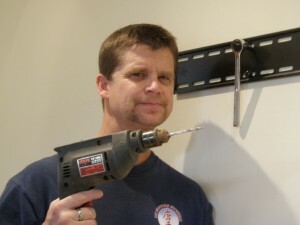 This entry was posted in Home and Yard and tagged central valley business times eric miller, Chico Enterprise Record, DIY projects, eric miller etc guy, eric miller freelance writer, etcguy facebook, flat screen TV, norcal blogs, norcal blogs etcguy. Bookmark the permalink. whoah this weblog is excellent i really like your posts. Keep it up!